For the second year in a row, the College of Environmental Science and Forestry (ESF) is ranked among the nation's top "Cool Schools" by Sierra magazine, the national magazine of the Sierra Club. In a list made public today (Aug. 22, 2017), Sierra puts the college at Number 4 among more than 200 schools surveyed. "It's been a big year for the greenest campus within the country's largest public university system," the magazine stated. Sierra noted ESF has "established a Green Revolving Fund - through which energy savings and investment returns are channeled to fund future sustainability initiatives - and equipped its buildings with controls that allow for more fine-tuned management of energy and water use." The magazine also called attention to ESF's decision to avoid pesticides and commit to a "native, largely edible landscape," which led to the Center for Food Safety to certify the college as "pollinator-friendly." "I am delighted by the Sierra Club's recognition of the fantastic work being done at ESF by our faculty, students, and staff," said ESF President Quentin Wheeler. 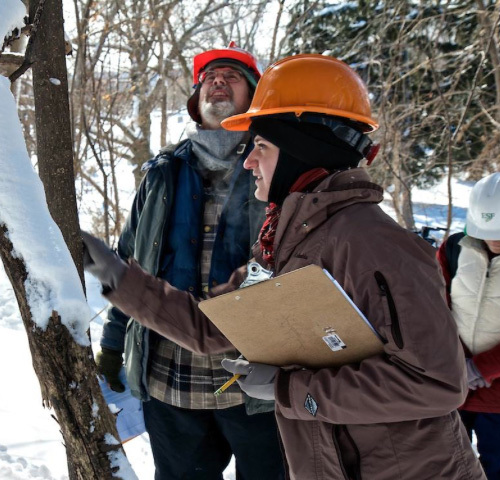 "ESF is dedicated to being a national showcase and living laboratory for sustainability, from our main campus in Syracuse to our 25,000 acres of forests, lakes, and wild lands." "This is a tremendous honor for SUNY-ESF to be recognized for its efforts in sustainability," said SUNY Chancellor Nancy L. Zimpher. "The entire campus is to be applauded for its ongoing efforts to safeguard the environment, and they are doing so for New York state in many innovating ways." When the Sierra Club introduced the annual rankings in 2006, just 10 schools were covered. This year, the magazine said, a record number of eligible colleges (227) submitted information on their environmental practices in food and transportation systems, water and waste management, purchasing procedures, academics, investments, and more." The magazine says its ranking "has helped schools justify sustainability departments and secure funding for power purchase agreements for renewable energy." "Above all," Sierra states, "it has encouraged a culture of transparency around sustainability initiatives." ESF is the highest-ranked public college in the nation and the highest-ranked school among all colleges and universities in New York state. In the Sierra survey, ESF scored 724.85 points out of 1,000. The college did particularly well in Sierra's co-curricular, investments, innovation, academics, planning, purchasing, waste and divestment categories. The raw data for the scoring came from the Association for the Advancement of Sustainability in Higher Education (AASHE) STARS self-reporting tool. Sierra took the information each school submitted to AASHE and scored it across 61 questions; there was also a supplemental question about fossil fuel investments.